These two terms describe different types of sheens available in any product category, be it beauty or paint. Other categories include; semi-gloss and flat. The higher the level of sheen that a product has, the more it seems to shine and reflect light. Gloss finishes have the highest sheen while flat finishes have the least sheen. Flat finishes can also be referred to as matte. Sheen is also a good indicator of the level at which the product can resist stains as well as how washable the coat of stain can be. Finishes that are glossy are very easy to clean while satin finishes need a little more effort to remove stains; flat finishes need the most effort to clean. Gloss products have the highest sheen compared to semi-gloss, satin and flat products. If an individual is looking for the shiniest finish, gloss finishes are the best option for both interior and exterior use. This shiny finish is admirable and it is considered to be professional because it hardly wears off. The quality of the product used is a variable that highly affects the end result. A good quality gloss product will give an immaculate finish and vice versa. 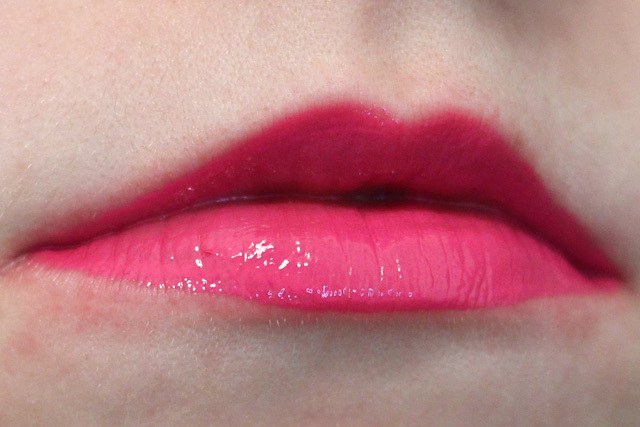 The amount of gloss in the product also affects the final look. The more the gloss present in product, the glossier the surface will be. Gloss finishes also reflect the most imperfections compared to other finishes with a different sheen but they are also highly resistant to stains. Products with high resistance to stains are the easiest to clean because the stains are easily washable. They can be cleaned easily by wiping and lightly washing the surface but with low gloss products a little more effort is required. For example, in terms of paint; gloss paints are mainly used in places that are regularly cleaned such as bathrooms, dining rooms, Kitchens, doors and walls. Not everyone prefers a glossy finish, so others go for a satin finish which is less shiny. Satin products have moderate sheen in them which makes it less reflective. Some people choose to use them in frequently used rooms such as Hallways, family rooms, bedrooms and living rooms. Such products highly withstand harsh cleaning such as scrubbing. Satin products are less glossy and therefore certain imperfections such as cracks and dents are less reflected. Satin products have a velvety feel. They are easy to clean but when compared to Gloss products, they require more effort. The biggest advantage of using Satin finishes is that it is durable. Even after harsh and regular cleaning, the paint on them does not easily wear off. The biggest disadvantage that comes with using satin finish is that it is not easy to touch it up after a while. This is because when touch ups are done the surface is not left flawless. Brush strokes are easily visible and this will make a surface less attractive. Gloss finishes has more sheen compared to satin finishes and this is why Gloss products are more reflective than Satin products. Gloss finishes are very shiny while satin finishes are ultra-shiny. This is due to the different level of sheen in gloss products and the satin products. Gloss finishes are highly reflective while satin finishes are less reflective. Due to the high reflectivity of gloss paints it is easy to see imperfections. Gloss products of good quality are highly stain resistant and are easy to clean while a good quality satin product is less stain resistant and therefore requires more effort to clean. Gloss finishes are easy to wash while satin finishes require more effort to clean. Gloss finishes only require light wiping or washing with soft cloths. Satin finishes may require more intense scrubbing during the cleaning process. Gloss finishes are easy to touch up after a while but satin finishes are tricky to touch up after a while. Gloss finishes are highly durable while satin finishes are moderately durable. Gloss finishes can be practically applied on surfaces in the bedroom, bathrooms and kitchen while satin finishes can be practically applied on surfaces in the family room, bedroom and living room. In general gloss finishing is much more expensive than satin finishing. When it comes to choosing the kind of finish you want then it is important to look at a number of variables to help make a decision. One factor is maintenance and the level of cleanliness you are aspiring to get. An individual should consider how regularly they clean the surface and do they do touch ups every now and then. Another factor is your budget. Every individual should consider how much they are willing to pay to get the finish of their choice. They should understand that the more the sheen in any point the higher the cost of the paint. The cost goes high as you step up the sheen scale. Evah Kungu. 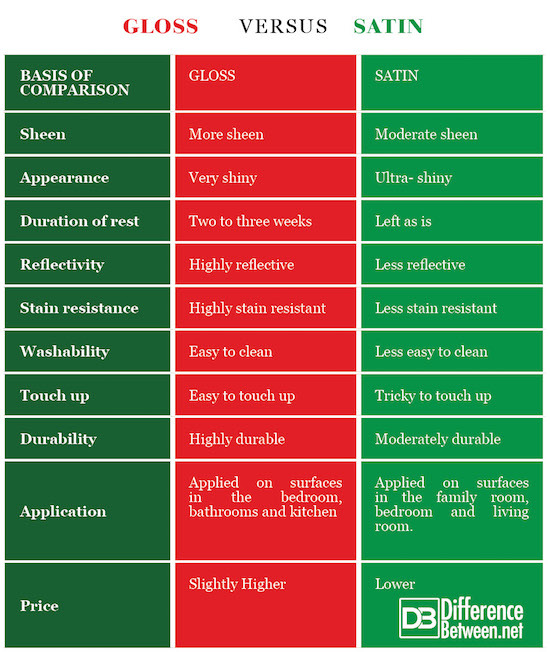 "Difference Between Gloss and Satin." DifferenceBetween.net. July 30, 2018 < http://www.differencebetween.net/language/difference-between-gloss-and-satin/ >.